American River College held a ribbon-cutting ceremony for the newly expanded Student Services building with a ceremony Thursday. The west side of the building underwent a 14-month, 5,500-square-feet remodeling from April 2014 through this summer. The Assessment Center, CalWORKs, Disabled Students Programs and Services (DSPS), Extended Opportunity Program and Services (EOP&S) and Financial Aid are all a part of the building, with the Veterans Resource Center and the Career Center set to move in next semester. Los Rios Community College Trustee Deborah Ortiz said she “marvels” at the “growth” ARC has seen in recent years. Ortiz went on to highlight the support the project received from taxpayers in the community. “This building wouldn’t have been possible without the tax payers and everyone who supported (county) Measure A,” she said. The expansion was funded in part by a series of bonds authorized under Measure A that have totaled $237.5 million as of the most recent series released in 2013. ARC President Thomas Greene also sent out his thanks to those involved and spoke on the ideas and decisions that went into the expansion. On behalf of the ARC administration, Public Information Officer Scott Crow said that the expanded building will allow for a variety of resources to be available for students under one roof. Chancellor of the Los Rios Community College District Brian King made a point to turn his attention to the ARC students. “I want to thank all of the men and women we do this for: the student,” said King. 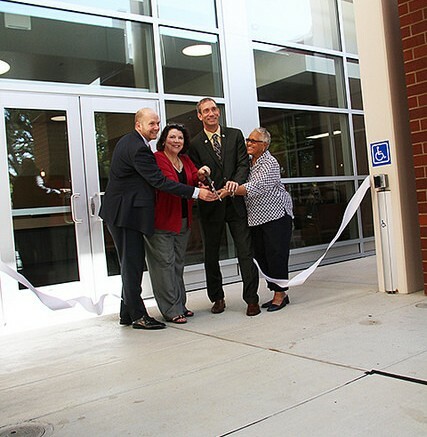 Be the first to comment on "ARC holds ribbon-cutting ceremony for expanded Student Services building"